A flaming object falling to earth, seen in the skies over Ibiza, has mystified local residents with an assortment of hypotheses ranging from meteorites to space junk. According to Diario de Ibiza, whose website (www.diariodeibiza.es) presents a video of the phenomenon seen last Wednesday, also includes a missile launch among the possible alternatives. The amateur recording shows a white, luminous body crossing the skies before vanishing behind a mountain without any signs of an explosion. 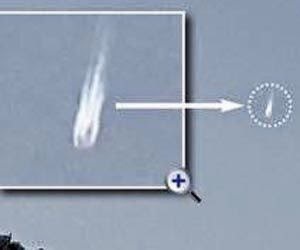 A spokesman for the Ministry of the Defense, after watching the video, dismissed the likelihood of a military device, suggesting that it might be a fragment of a space vehicle or section broken off a launcher as it re-entered the atmosphere. Members of the Agrupación Astronómica de Eivissa, quoted by the source, discarded the meteorite hypothesis, due to the object's vertex, leaning toward the possibility of a manmade device. Ignacio de la Cueva, a member of this organization, reported that the telescope at Cala d'Hort had also captured the phenomenon and detected an odd trajectory, as the object changed course, which could only be explained if it was self-propelled.